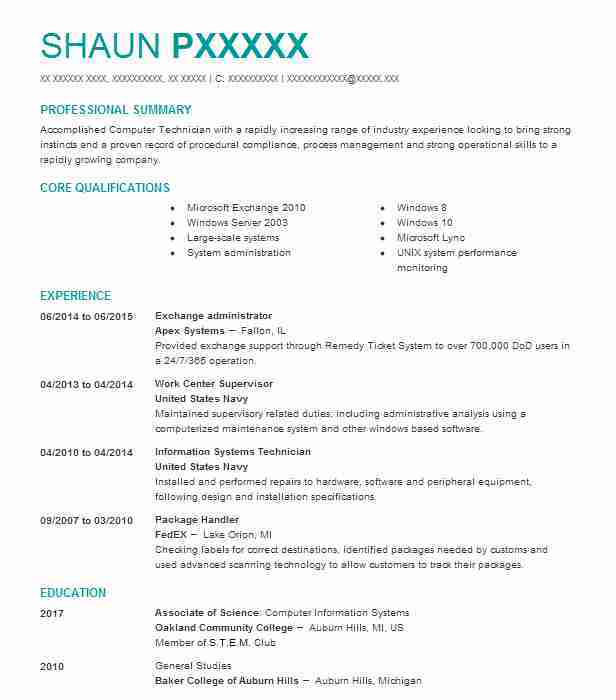 Enterprising Exchange Administrator proficient in setup and maintenance of related systems on Microsoft platforms. Experience with all common MS desktop applications related to Exchange. Specialize in server installation monitoring and troubleshooting. 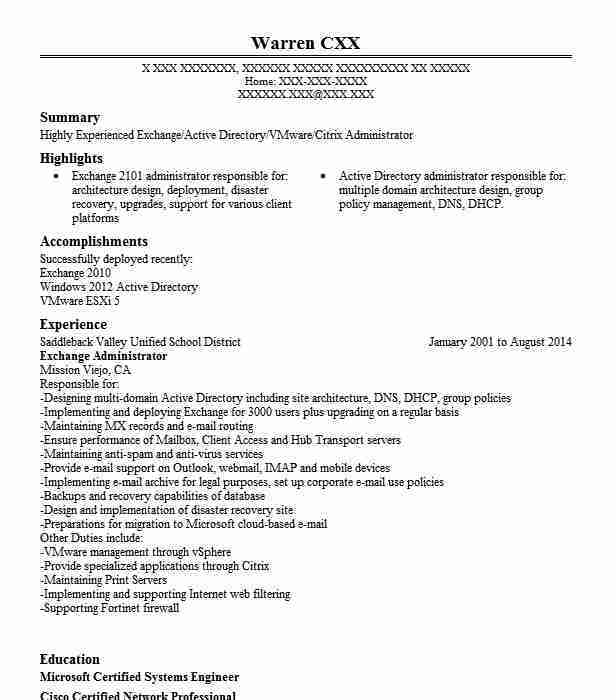 ¥ Administered MS Exchange and provided server support. ¥ Implemented server security procedures. ¥ Performed assigned tasks in a timely efficient manner. ¥ Implemented a comprehensive server recovery plan. ¥ Administered MS Exchange and performed regular system checks. ¥ Monitored all technical aspects of server operations. ¥ Provided support for related Exchange applications. ¥ Ensured smooth operation of Exchange server to increase office productivity. ¥ Developed efficient technical support procedures. ¥ Supervised technical support staff. ¥ Managed all server hardware and software. ¥ Set up a data maintenance center to address system issues. ¥ Maintained Exchange server and all related applications. ¥ Worked with external agencies to resolve system issues. ¥ Established backup system and disaster recovery plan. There are plenty of opportunities to land a Exchange Administrator job position, but it won’t just be handed to you. 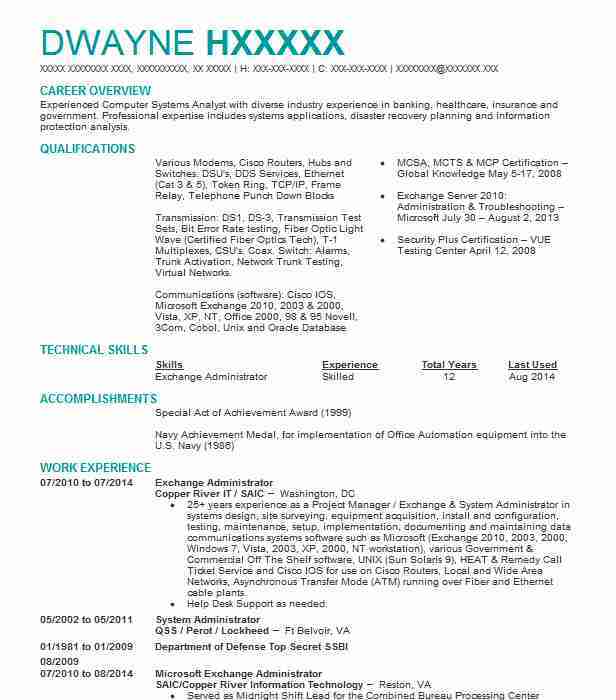 Crafting a Exchange Administrator resume that catches the attention of hiring managers is paramount to getting the job, and LiveCareer is here to help you stand out from the competition. 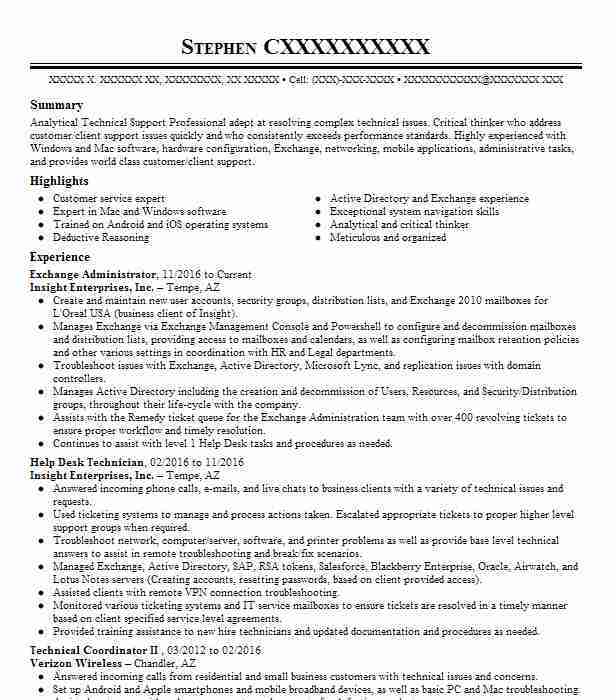 Exchange Administrator @ Insight Enterprises, Inc.